Whether your Hatteras Island dream home is an elaborate sanctuary or an understated hideaway, Midgett Realty’s dedicated full-time construction team is at your service. We will work with you to bring your vision to life, from design to delivery. Working closely our clients, we have all you need under one roof. No matter if you’re looking to Remodel an existing home, or add-on construction, such as an Outdoor Entertainment Area, Midgett Realty’s Outer Banks construction team is for you! From building porches and tiki bars to constructing homes from the ground up, we do it all. Midgett Realty’s Construction Team can build the custom home of your choice or offer you suggestions from our in-house assortment of building plans. Dream big, dream small, but whatever you dream, your Hatteras Island construction project will be just right when you work with Midgett Realty. 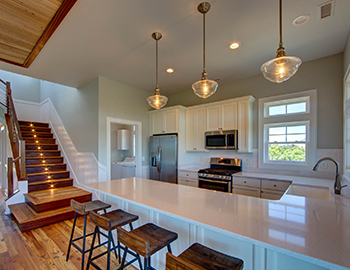 Looking to make a few updates to your Hatteras home or rental property? We can do that too! Designing and remodeling bathrooms, living areas, floors, kitchens, bedrooms and much more, Midgett Realty will make your remodel come to life. We also offer services for building entertainment areas such as decks, porches, pool areas, tiki bars, and any other outside leisure areas you can think of. Add to your home’s value & aesthetic appeal or simply create a new space for your family to come together. 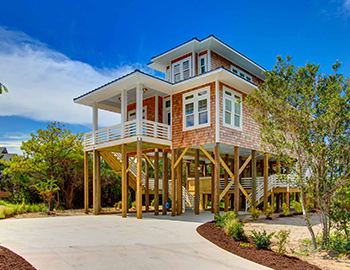 Our specialized knowledge of local building codes, laws, and aesthetics make us your #1 Hatteras Island construction choice! This knowledge comes from years of living & working on the Outer Banks. Since the 1960s, Midgett Realty has been family-owned and operated, so when you build with us, you’re building on multiple generations of Hatteras Island expertise. Feel free to browse through our photos of projects past to see other dreams we have brought to life. We invite you to visit our construction office, located next to our main office in Hatteras Village. Let us show you how we can coordinate our knowledge & know-how with your tastes & wishes to build your very own Hatteras Island dream house! Midgett Realty is proud to be a one-stop shop for Real Estate Sales, Construction, and Vacation Rentals. If you find a lot or home that is just what you're looking for through our Midgett Realty Real Estate Sales department, our Midgett Realty Construction team would love to help you build on your new piece of property, or renovate your newly purchased home! Also, if you are interested in renting your home through our Midgett Realty Vacation Rentals, we can handle that for you as well. With our elite Property Management staff, you can rest assured that everything will be taken care of. Our Construction Office Hours are 9:00am to 5:00pm, Monday-Friday. Please call 252.986.2924 or fill out our construction contact form any time and we'll get back to you!